Known for his large-scale installations, South Korean artist Do Ho Suh uses architectural elements from his immediate surroundings to reflect on identity. His latest project - a giant green hallway-like structure - is a life-sized abstraction of space. Made completely of textile, it appears as though it has objects inside like a door and phone covered in green fabric; in reality, everything has been constructed of the stiff green material. 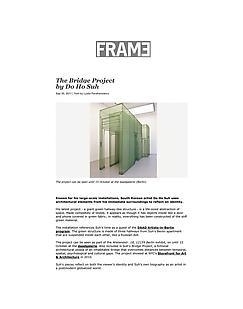 The installation references Suh’s time as a guest of the DAAD Artists-in-Berlin program. The green structure is made of three hallways from Suh's Berlin apartment that are suspended inside each other, like a Russian doll. The project can be seen as part of the Wielandstr. 18, 12159 Berlin exhibit, on until 15 October at the daadgalerie. Also included is Suh's Bridge Project, a fictional architectural utopia of an inhabitable bridge that overcomes distances between temporal, spatial, psychological and cultural gaps. The project showed at NYC's Storefront for Art & Architecture in 2010. Suh's pieces reflect on both the viewer’s identity and Suh’s own biography as an artist in a postmodern globalized world.